Natasha Houseago studied at Brighton Art College obtaining a BA (Hons) in Fine Art. 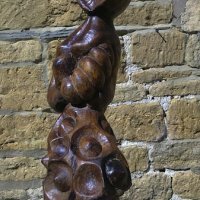 She undertook a postgraduate diploma in Fire Art, Sculpture in Cyprus. Natasha has exhibited widely and has combined teaching with residency projects here and abroad. 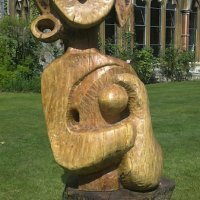 She has just completed a year long residency at Bournside School in Cheltenham where she carved three huge green wood sculptures which have been sited outside in their quad. Natasha says ‘I make many loose drawings around a particular theme. 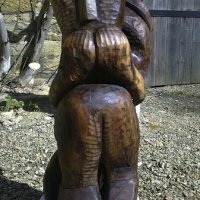 I then draw directly onto the green timber and begin the blocking cut process, using a saw and axe, followed by hand chisels, rasps and scrapers. My work is a way of expressing my innermost fantasies and fears and is a means of connecting with this utterly confusing world’.